My precious friend, Melissa, with her granddaughter Josie. They have a mutual admiration society. Melissa is Joey's second Mama. Her son, Kevin, is Josie's daddy, and Joey's best friend-- since they were babies themselves! She was named Josephine in honor of our son, and it always gives us a thrill to see pictures of her Royal Pinkness. 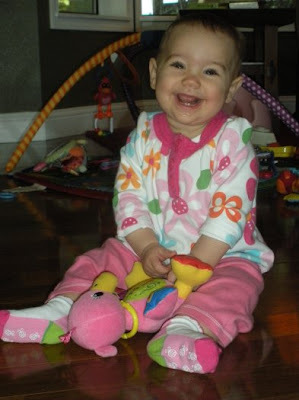 She may be one of the cutest babies in the history of the world! 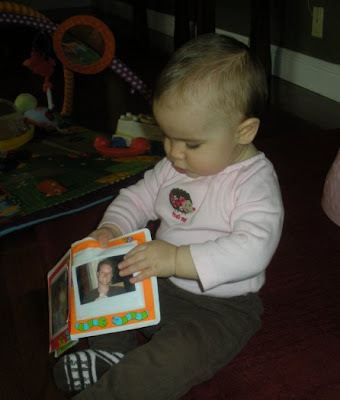 Here she is getting to know her Unkie JJ from her own special book about him. We love you, Josie. You are our sunshine girl. We love and miss you, Melissa and Kevin and Molly. She will carry the name well...she certainly can light up a room! She is so beautiful...well done Kevin and Molly:)) Beautiful picture of Melissa and Josie - how precious. Aw she is so cute. She has really gotten big now. I love that book that was made for her, too sweet. Sad that Joey never got to meet Josie, she would have loved him and he would be such a good uncle to her the way he was to my kids. I still remember some of the loving eyes and caring touches certain elementary Sunday school teachers shared with me. Amazing how their love of God penetrated my young heart so I recall their gestures even to this day.